The kitchen at Canyon 49 Grill is in new hands — but they aren’t new to each other. The restaurant’s Executive Chef, Marcus Maggiore, and its Sous Chef, Mike Willison, met more than a decade ago at a Four Seasons Resort. For six years, Willison worked alongside Maggiore as his No. 2 in command before they reunited this year at the Grand Canyon University Hotel and Restaurant. Maggiore started at Canyon 49 in January. And when his sous chef position became available, the hire was a “no-brainer,” he said. Willison, who started in May, said that when he answered Maggiore’s call for the job he was surprised to hear about the restaurant, located in the University’s 27th Avenue office complex but open to the public. Both chefs say they’re confident word will get out about what Maggiore calls a “hidden jewel” in Phoenix. 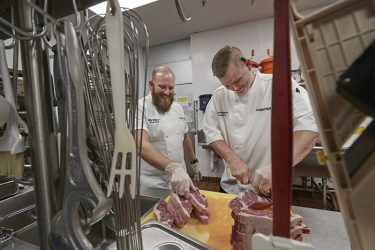 Canyon 49 Grill chefs Marcus Maggiore and Mike Willison share a laugh. The chefs know popularity will grow over time but said they will start to participate in promotional events along the way. 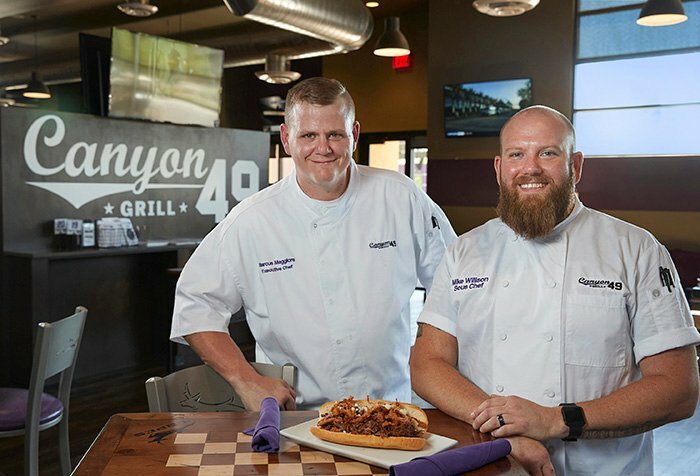 One of those coming up in July is the Arizona Governor’s Conference on Tourism, where Canyon 49 staff will prepare hundreds of short-rib slider sandwiches for attendees. “We’re trying to get the name out there a little more and start getting more locals in here,” Willison said. As for the menu, Maggiore says the biggest sellers by a long shot have been the barbecue burger and wings. Those meals aren’t going anywhere. But the chefs do have some seasonal changes in mind. Willison said the goal is to make each dish its own for the new menu debuting in August. It won’t be too elaborate but will feature fall tastes such as braised cauliflower and sweet potatoes, Maggiore said. The restaurant also will start to dress salads so customers do not have to do so on their own, he said. Another change could come in the burger selection, where pretzel buns might be replaced with a brioche bun. Overall, Maggiore said he’s been nothing but impressed with working at GCU.